If you did, you can’t remember. So you hit reply and dash off a quick response. Moments later you get a response and print it off this time so it doesn’t get lost. Tomorrow you’ll be taking the wiring instructions to the bank. This scene is being played with greater and greater frequency in Indiana. 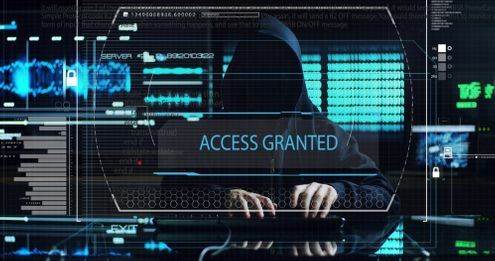 Hacking into the email accounts of Agents, Title and Mortgage Companies and even the actual Buyer, these modern-day pirates monitor the back and forth conversations closely for the right timing, then send out their copy-cat email snare to drawn in the unsuspecting buyer. If the buyer bites, their closing funds are wired using the scammers wiring instructions and head directly to a remote account. To avoid a possible kill chain action, the cyber-criminal sweeps the account clean of all funds ever few minutes. Obviously, it’s never sent to the Title Company. But this goes undiscovered until the actual closing when the expected funds never arrive. The money’s vanished…the closing is canceled…and the dreams of both buyers and sellers are shattered. That’s what a Washington D.C. couple who lost 1.57 million when their wire transfer was stolen would like to know…none of their funds have been recovered. We were in a state of shock, disbelief, denial depression to enraged. The injury gets worse and the blows kept coming. News flash!! You’re not protected when you wire money. Today’s banks are hyper-aware of security risks and vigilant at detecting fraud, but at the end of the day, they’re just following the wiring instructions you provided. It is up to you to be completely sure you are giving them the correct information. Even one number off can send the funds into a completely different account half-way around the world. First of all, be aware that this is a REAL problem…and it’s happening every day! We are! And are taking every opportunity to educate our clients. WIRE FRAUD: If you receive any electronic communication directing you to transfer funds or provide nonpublic personal information, EVEN IF THAT ELECTRONIC COMMUNICATION APPEARS TO BE FROM BROKER OR TITLE COMPANY, do not respond until you verify the authenticity by direct communication with Broker or Title Company. Do not rely on telephone numbers provided in the electronic communication. Such requests may be part of a scheme to steal funds or use your identity. I do not send wiring instructions for real estate transactions via email. Please contact the title company handling your transaction by telephone or in person for the correct wiring instructions. Please do not convey your financial information via email to me, and contact me via telephone regarding any suspicious or inconsistent communications. And then, if you receive ANY communication, email or text, that mentions “wiring instructions” treat it suspiciously. No Agent, Title Company or Mortgage Company is communicating any wiring instruction to you this way. Educating our clients about this possibility is important to our team, so when this home buyer received a suspicious email, he immediately forwarded it to us to check out. 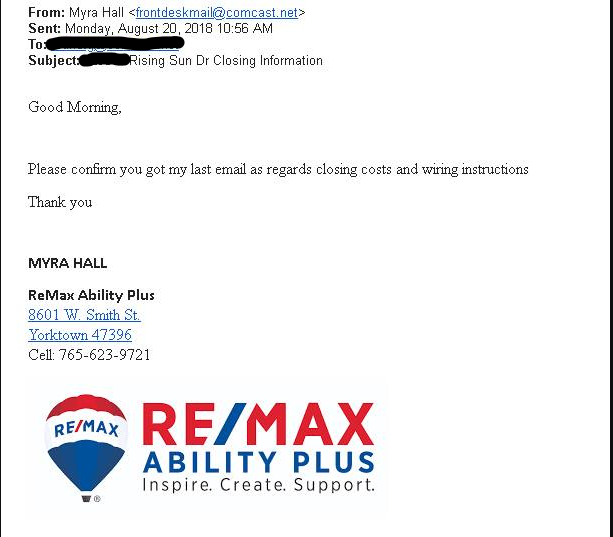 The “From” said Myra Hall, but the email didn’t match – Good catch! Our standard “I do not send wiring instructions” disclaimer was no where to be found. These scumbags prey on the frazzled and uniformed. It’s better to be overly suspicious than to have your dreams smashed at the closing table after being victimized by this scam.